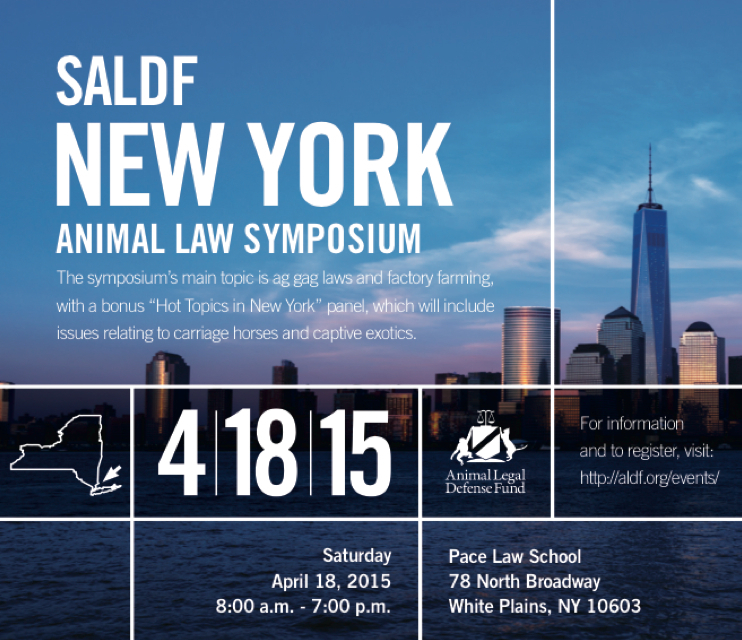 Join us for the 2015 SALDF New York Animal Law Symposium! The symposium is presented by the SALDF chapters of Pace Law School, CUNY School of Law, Columbia Law School, Yale Law School, Brooklyn Law School, and NYU School of Law, and is sponsored by the Animal Legal Defense Fund (ALDF). Register at http://www.brownpapertickets.com/event/1364349. When: Saturday, April 18th, 2015 from 8:00 AM to 7:00 PM. Please join us for the first regional symposium of the New York area SALDF chapters. The symposium’s main topic is ag gag laws and factory farming, with a bonus “Hot Topics in New York” panel, which will include issues relating to carriage horses and captive exotics. Featuring many ALDF speakers, including Director of Legislative Affairs Chris Green, Litigation Fellow Jeff Pierce, Of Counsel Justin Marceau, and Manager of Investigations T.J. Tumasse, Professor David Cassuto, and many more esteemed speakers from animal law related fields. For a complete list of speakers and the most up to date panel information, please visit our Facebook page at https://www.facebook.com/events/343435589190374/.